Knit Like You Mean It. | Knit Like You Mean It. As those of you who have seen my posts on Instagram and Twitter may remember, I lost the URL on which I had been blogging back in December. No one’s fault but my own, and isn’t that the worst. 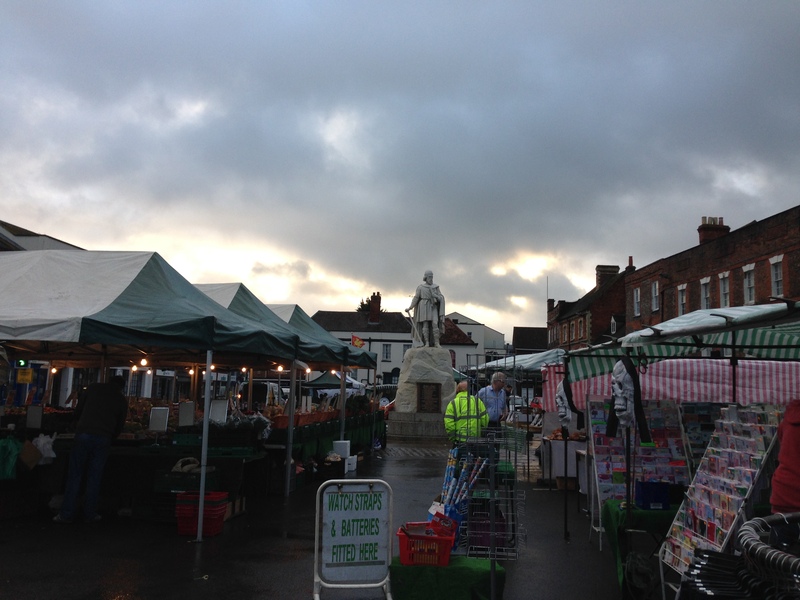 While I try to decide how to cope with that tangle, maybe I can just use this blog to try to chat to some of you again. What about you? And — does anyone read blogs, these days? Write a dating profile for one of your past finished projects. 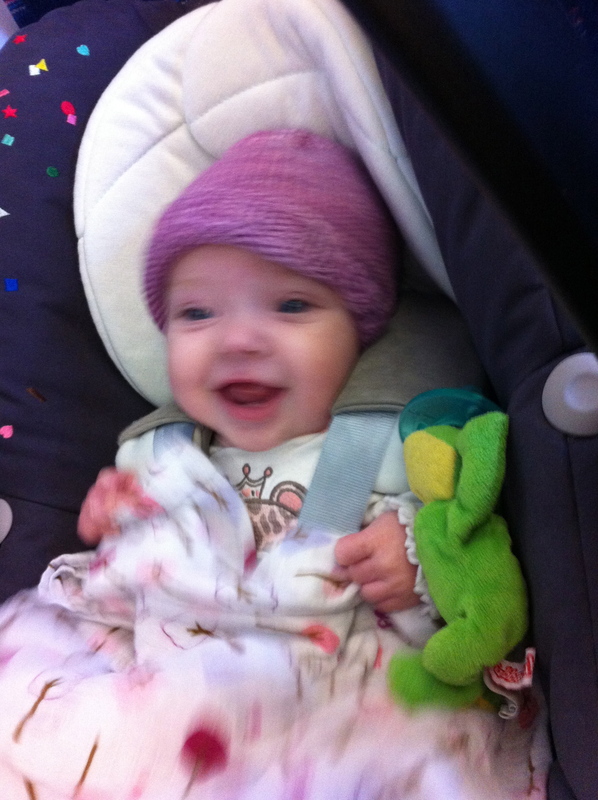 Alex’s pink hat with some cute little socks, which Alex wore maybe once. The hat on a train to Wales. With three-month-old baby. Westward Ho! Hat discovers America. 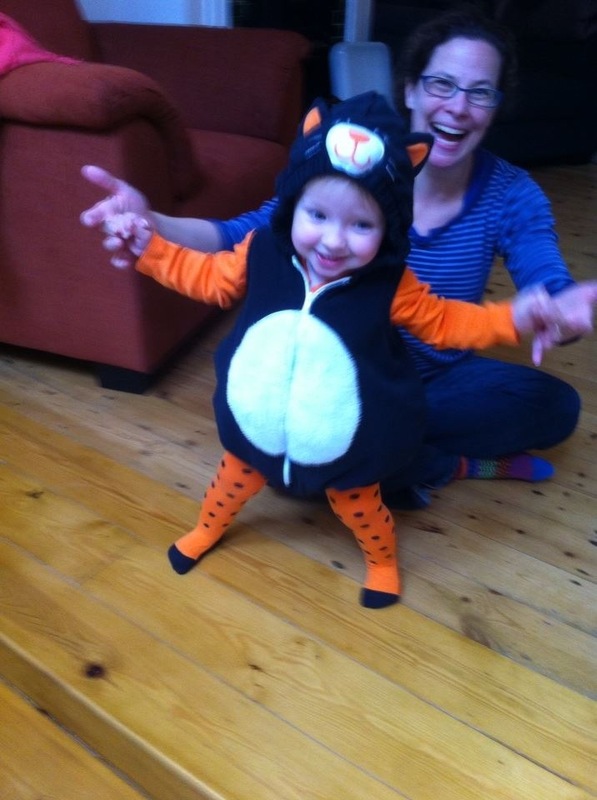 Baby discovers her own cuteness. 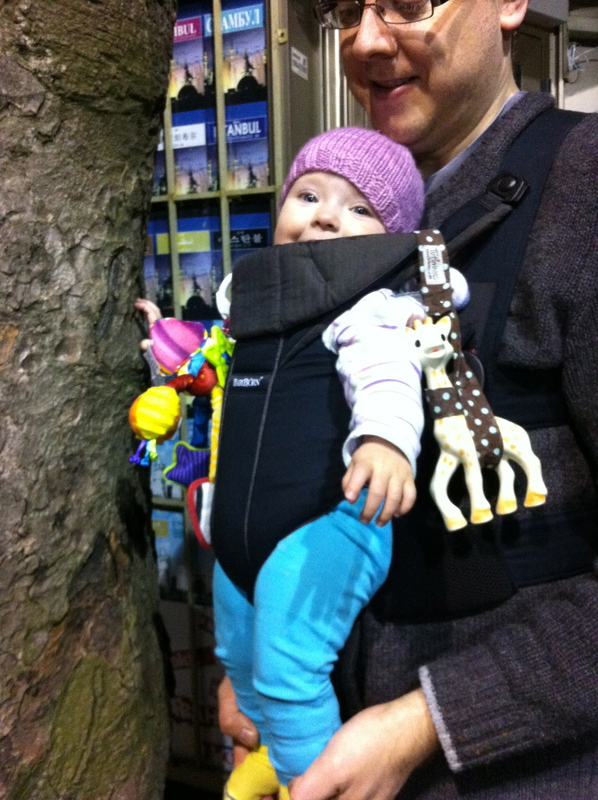 Mr. Trask, Alex, the hat, and Sophie the Giraffe in Turkey. On the Asian side of Istanbul: a whole new continent! Also, some cute kid in the background. In search of new head and/or fellow hat with whom to explore the colleges and thrift stores of Oxford with a view to attending a bop. 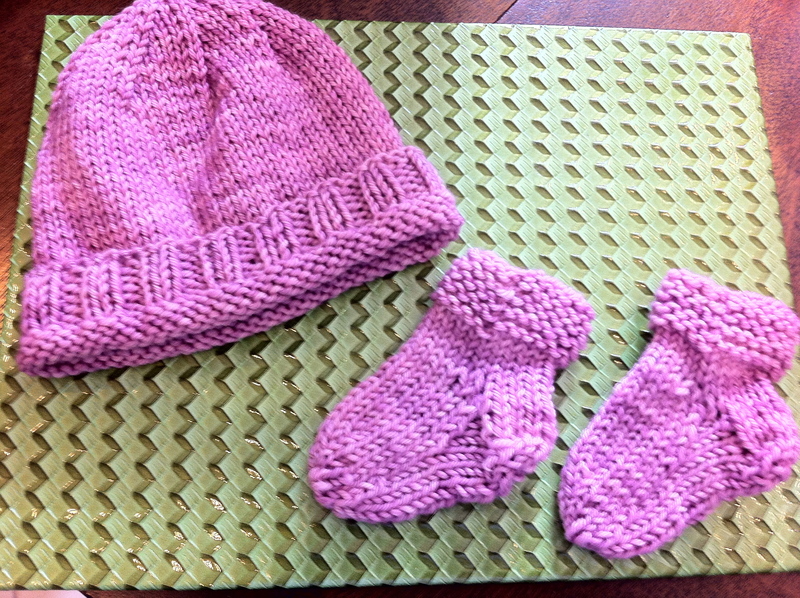 Willing to consider hat of other colors and fibres, but machine-knits need not apply. 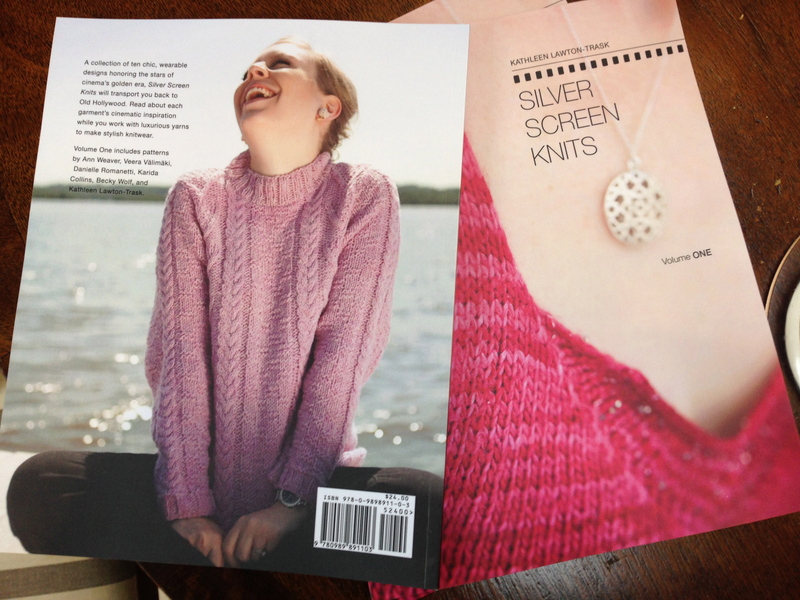 Have you ordered your copy of Silver Screen Knits, Volume Two yet? Copies begin shipping on Thursday, May 15! Use code SSK-BLOG for a 10% discount on the book, or sign up for the Silver Screen Knits Behind the Scenes newsletter to get a code for a larger discount. Silver Screen Knits, Volume One: Real Live Books. But that’s all I’m going to say about that today. When last we spoke, I was supposed to be headed to The Small Wool Gathering, a reunion of sorts for Plug & Play Pembrokeshire alumnae and friends organized by The Small Crafters. 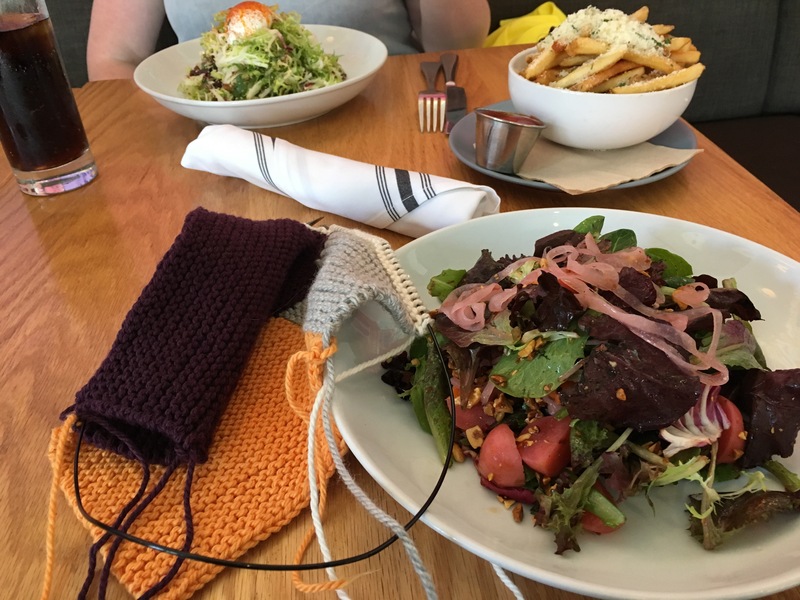 From all I have heard, it was an amazing weekend, with great food and camaraderie, plus top-notch classes by our favourite knitting editor, Amy Singer. But no sooner had Mr. Trask and I gotten into our rental car (brave us! driving!) 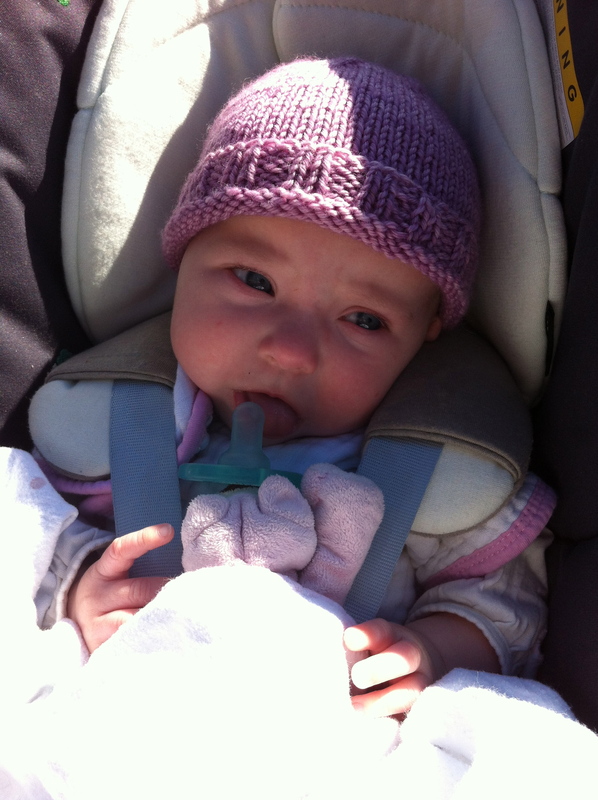 than Little Miss Feisty got the merest hint of sick and we had to turn back. I am sure you can imagine that the weekend was rather different than what we had planned, and we were so sad to miss everyone. And best of all I got to learn Auto-Pilot Socks and Silk Spindling with Amy. Which was the highlight of the month. 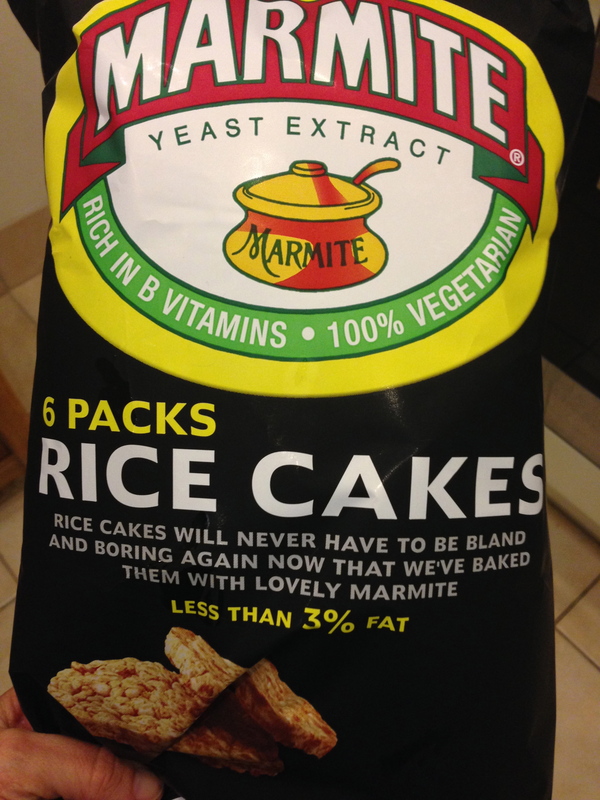 Anyway, that’s the big news from here. What have you been up to in the last month? And would you like to come to a party? There will be drinks, and a discount on the book and on yarn purchased to make any of the designs in the book. And some of us will be dressed in vintage clothing. A lovely time will be had by all! I’ll be there signing books, so do pop in. Otherwise, who will I talk to? In all the excitement of releasing the book (eek! 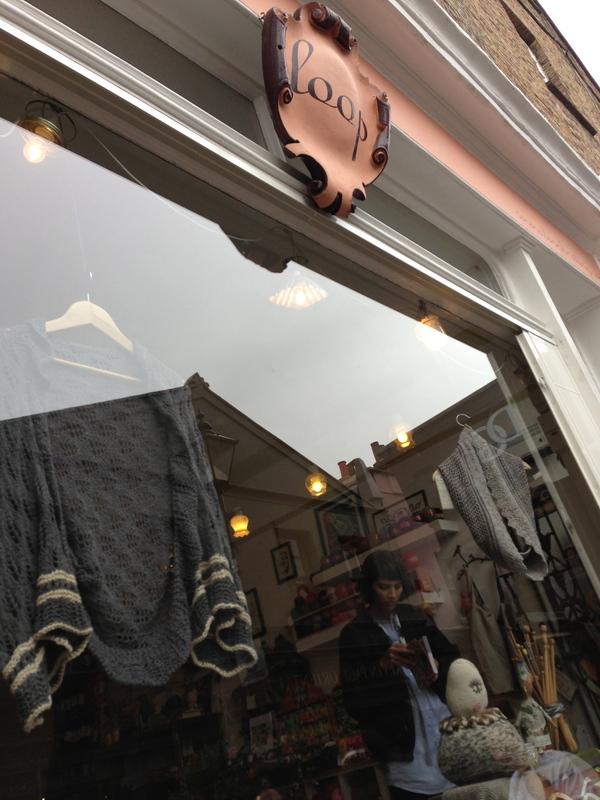 ), I didn’t have a chance to tell you guys about the Great London Yarn Crawl. 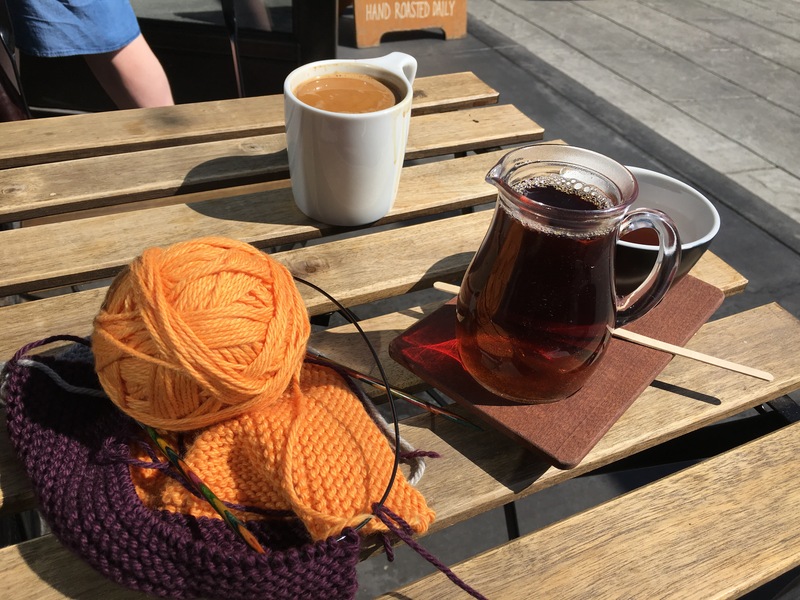 This was a new event, planned by crazy Rachel and crazy Allison, in which five groups of 10-15 knitters each dashed all over London, dropping into various yarn and crafty shops, knitting and crocheting and crafting and shopping and chatting. It was amazing. Loop! Loop. Oh, Loop. I cannot tell you how I loved it. 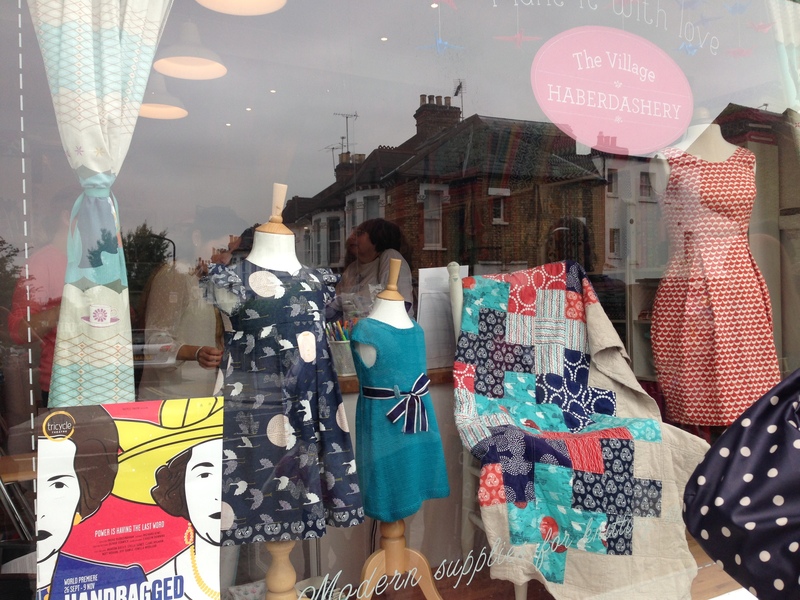 The Village Haberdashery: Beautiful Window. 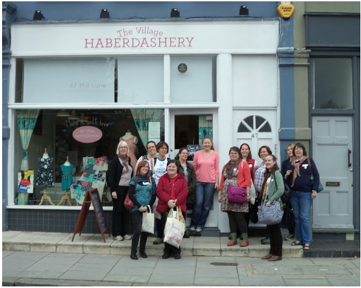 Purple Group at the Village Haberdashery – you can see me, grinning at the prospect of more yarn, in the back row. I have a problem. But it’s such a nice one. I do wish that I knew how to sew. I mean, I can hem a skirt (by hand) and sew on a button, but nothing else. I understand sewing is a bit quicker than knitting, which sounds wonderful. But I also understand that it requires a bit more precision than knitting does, which…would probably not work for me. Anyway. 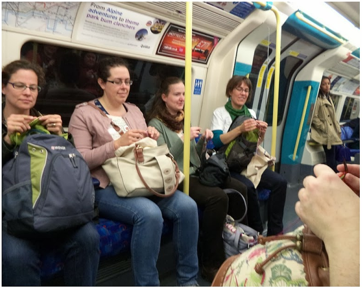 Knitting on the Tube – I am trying to place my stitch markers correctly for about the fifth time. Off to the right is Shannon, one of our fabulous volunteer leaders. The last stop was Sharp Works, another really welcoming shop. I had hit a wall by then, I’m afraid, and was missing Little Miss Feisty, and I now find that I took no photos. 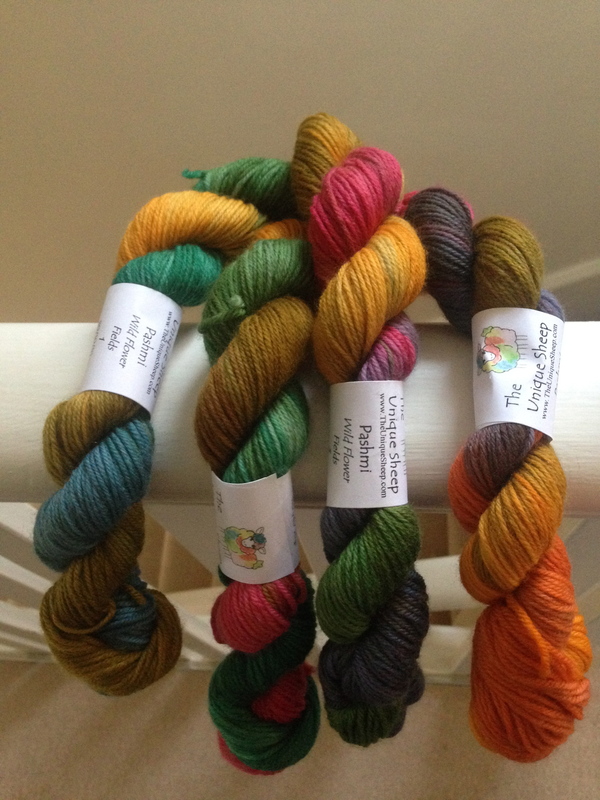 I was thrilled to see both Manos and Mirasol there, and bought some lovely sock yarn. You all know I’m not usually a joiner, and feel sort of shy in groups (even groups of knitters). 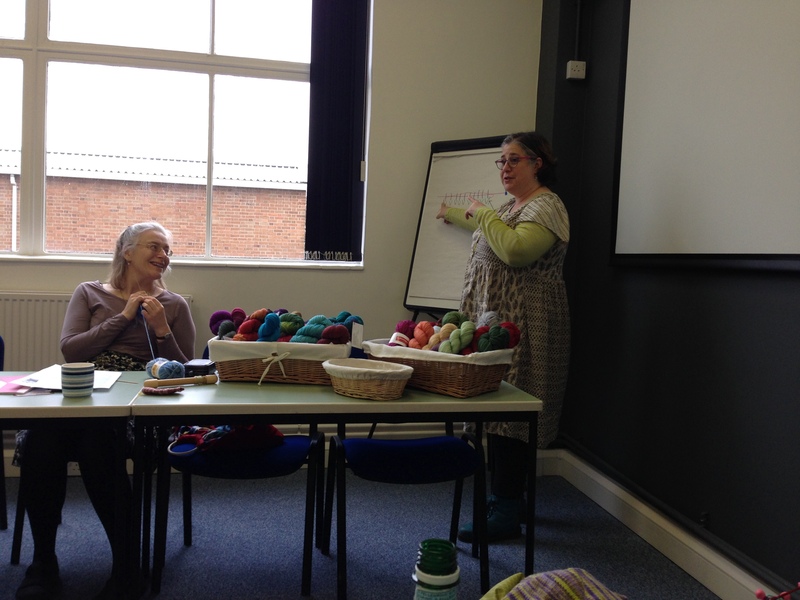 But the yarn crawl was delightful – a long, tiring day, but a worthwhile one. Would yarn crawl again! So one housekeeping bit: do comment below or email me at KELT (at) knitlikeyoumeanit DOT com to let me know if you have knit squares for Alli’s Wool Week yarn-bombing, so I can enter you in the Brooklyn Tweed LOFT giveaway. 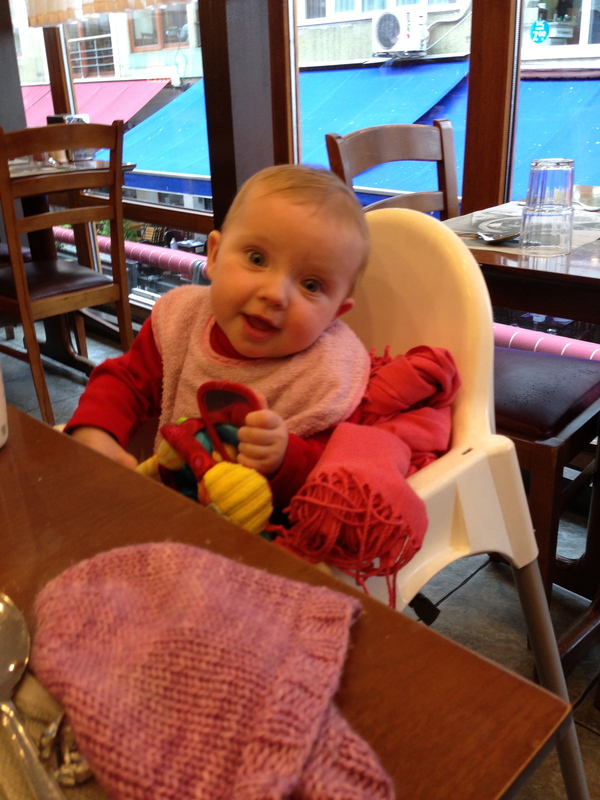 And tell me – were you at the yarn crawl? Or have you been to any yarn shops in London? Which would you recommend? 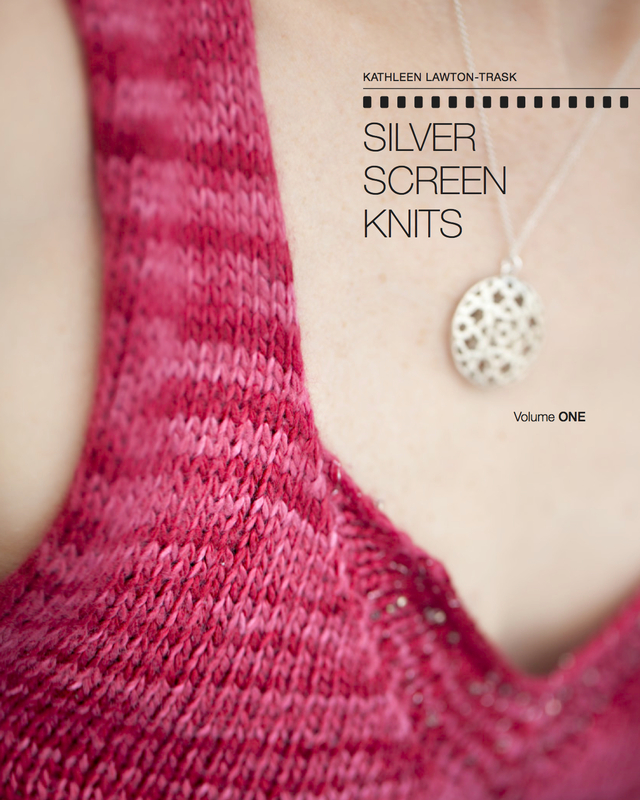 So, deep breath: Silver Screen Knits, Volume One is available for purchase as an ebook or a print/PDF download combo. You can buy it! I kid you not! – PRINT BOOK SHIPS OCT. 21. Obviously, if you buy the book as a Ravelry download, you’ll get it immediately. If you buy the print book, it will be shipped to you on Oct. 21, and you’ll immediately receive a link to download a PDF of the book as well. I’ve mentioned before that subscribers to the Silver Screen Knits Behind the Scenes list receive a discount on the book; I sent that discount to them over the weekend, but you can still get it if you subscribe now. Additionally, if you purchase the book on Ravelry, you will receive a discount on the print book. The 10 patterns in Volume One were inspired by some amazing classic movies, including Bonnie and Clyde, The Women, The Philadelphia Story, and Bullitt. The text includes descriptions of the films, memorable lines from each film, and even notes on where knitting appears in some of them. The Elizabeth Taylor Lace-Edged Dress, designed by me. The patterns in the book were inspired by the men and women who performed in the movies as well as the garments they wore. I started looking into knitting and classic movies because of some beautiful photos of Audrey Hepburn, Greta Garbo, Ingrid Bergman, and other stars knitting on set between takes, but the book idea also grew out of the chic garments of the golden age of Hollywood and a bunch of fascinating movies, some of which we still watch today, and some of which we ought to. As most of you know, this book has been in progress for a while, as I got permission to use film stills and lined up designers and yarn companies to participate, found an amazing photographer and stunning graphic designer, and stalked them all until they agreed to be part of the book. It took some time to pull together, but I am really excited about the result. I launched the sales of the ebook and the preorders of the print book over the weekend, but waited a few days both to give list subscribers a chance to order and to make sure that everything was working properly before really announcing it here. Thank you so much to everyone who has ordered already – I am bowled over every time an order comes in. I had a lot of help on this book. Danielle of Fibre Space and Karida of Neighborhood Fiber Co. told me that it could and should happen, and then they talked me through all kinds of anxiety while I made it happen…and then they contributed patterns and helped me find other designers and yarn companies to get involved. 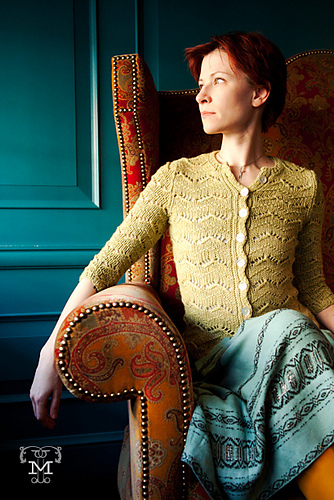 The Meryl Streep Lace Cardigan, designed by Ann Weaver. 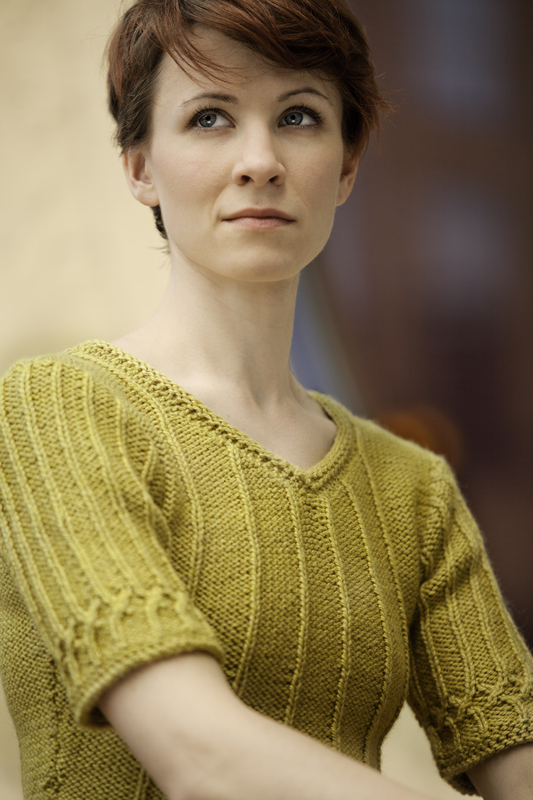 Ann Weaver has been involved in so many different aspects of the book, from designing patterns for Volumes One and Two to giving me feedback on my designs to modeling the sweater she designed and then becoming our model for several other garments as well. 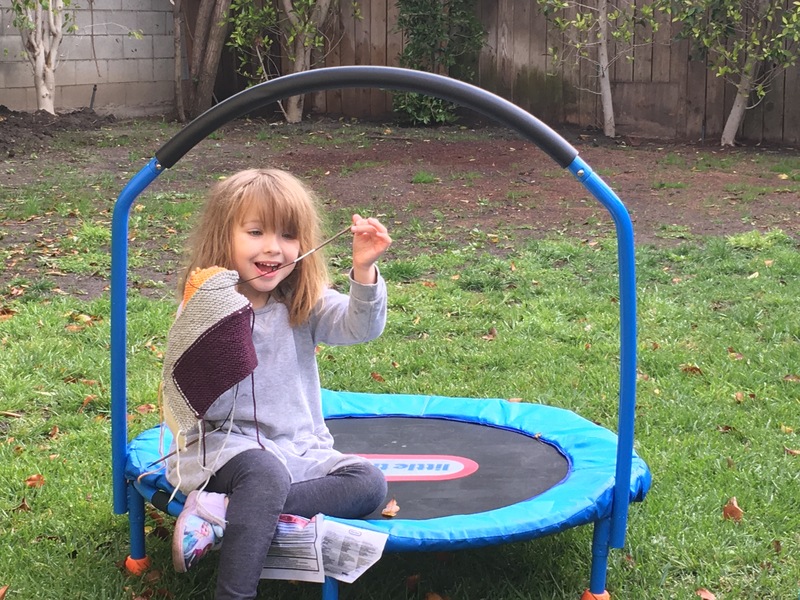 Can you believe how cool knitters are? I just love them. Thank you, all of you, for helping make this book happen. The Joan Crawford Trumpet Skirt, designed by me. Yes, it’s the post you’ve all been waiting for: the winners of our Spud & Chloë prizes. And look at even more of them over on the Ravelry discussion thread. We’ve had several people come out of the woodwork in the final days, which is really exciting. One wonderful thing about this pattern is how flexible it is – the different choices of colors and modifications really show that off. 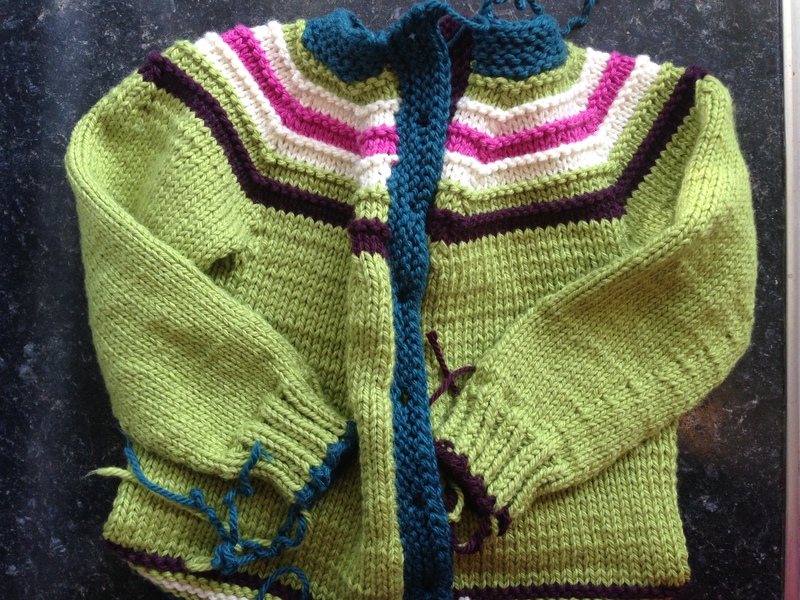 Check out the various projects on Ravelry to see how many different ways you can make this cardigan. 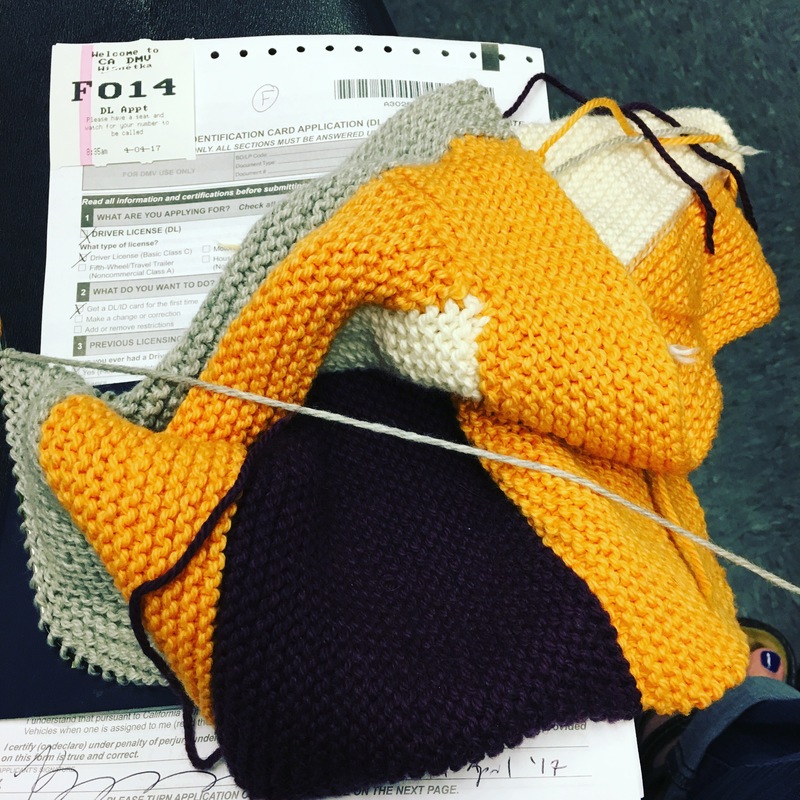 Excitingly, Stephanie is working on adult sizing for the pattern, so pretty soon we might need to do this again. Prize One! 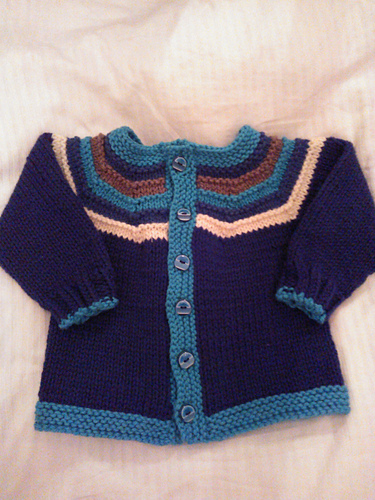 For a random person who began the cardigan. 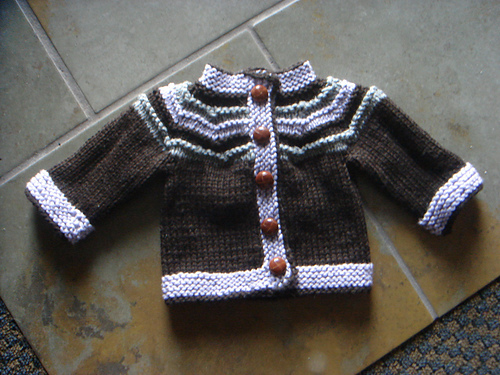 The Random Number Generator, well-known to those who read this blog regularly, chose alcbrooks, whose sweater is among the FOs above (I love those buttons, don’t you?). 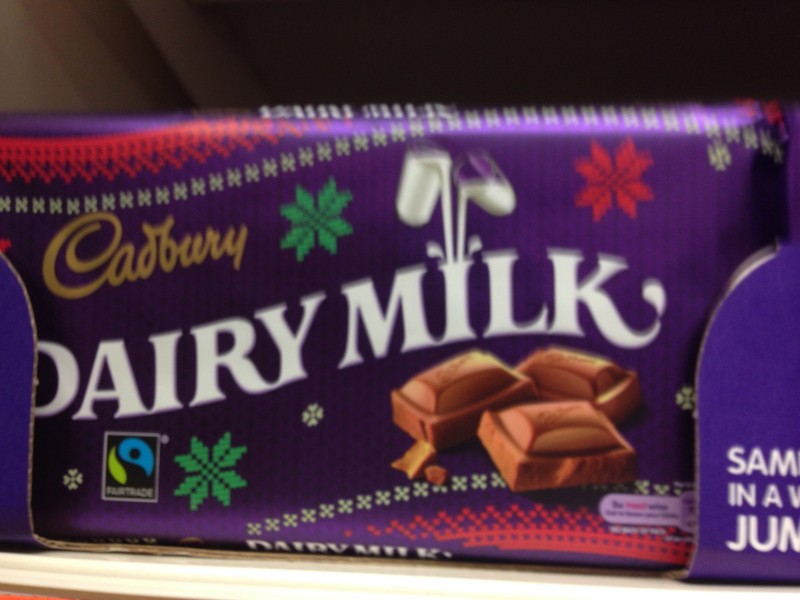 Prize Two! 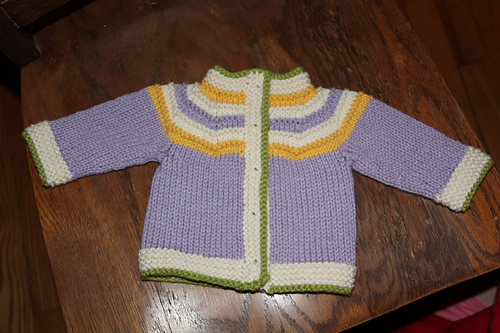 For a random person who finished the cardigan. The RNG chose ewehinger – who, coincidentally, lives very near my hometown of Chevy Chase, Md. 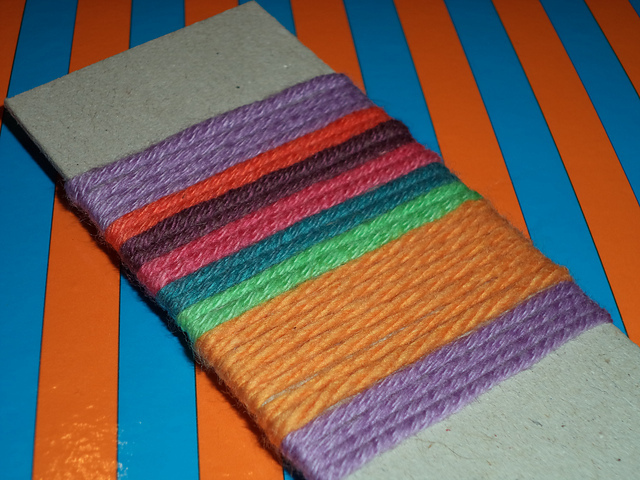 Sally wound strands of yarn around a piece of cardboard to test out different color combinations. Simple, yet ingenious. 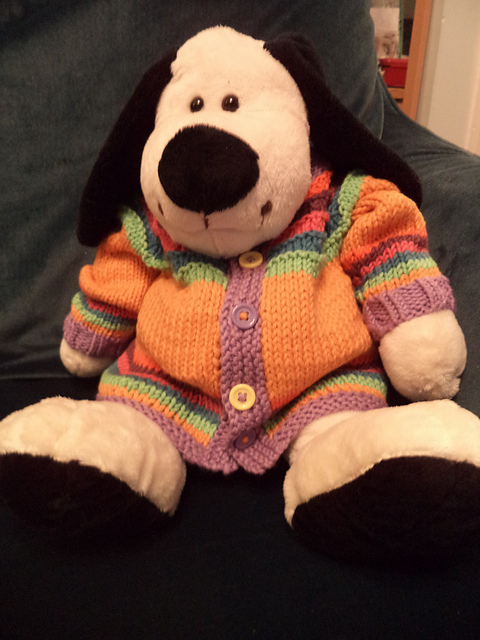 Sally’s finished sweater – on a more willing model than mine. 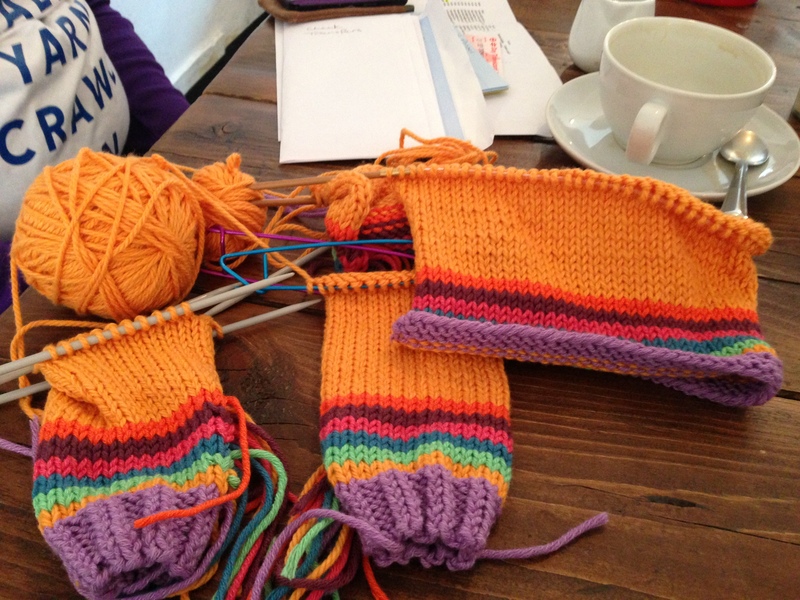 Sally’s sweater in progress at the Great London Yarn Crawl, where she was a volunteer leader. I LOVE how [Sally] added rainbows to the wrist and waist. There is so much color in her sweater. 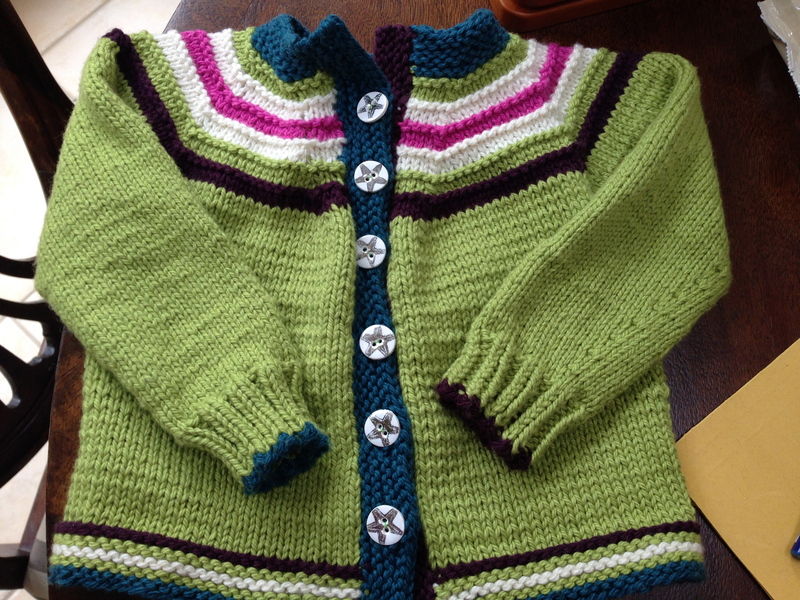 She even added a little extra zing by adding buttons that alternate color. She made a lot of very conscious color decisions…ones I never would have thought of. Her cardi is full of surprises. It’s rainbow-tastic! Thank you all so much for joining me on the crazy ride that this knitalong has been, and especially thank you to Catherine, my co-conspirator, and to Spud & Chloë, for offering such amazing prizes. 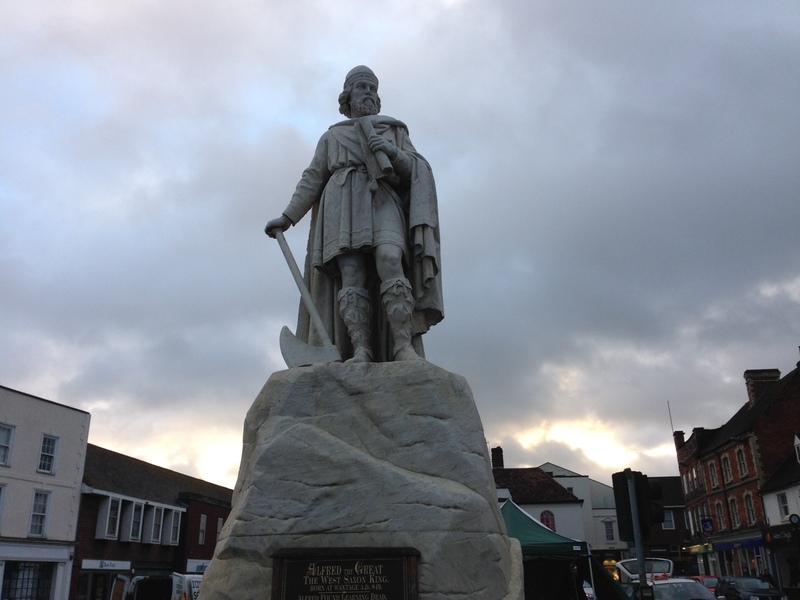 Hurrah for all of you…I do love how knitters are willing to do crazy things together. So tell me in the comments – would you want to do this again? What kind of pattern would excite you? Just have to weave in the ends. I finished my sweater yesterday and bought buttons today at the glorious Oxford Yarn Store (about which more later in the week). Then I (I am not making this up) went to a meeting and got stung by a wasp several times while trying to discuss those pesky scheduling issues that often come up at meetings. I wouldn’t mention it, because you know I never complain, except that somehow in the bustle of ice-getting and kind-advice-taking (“Put vinegar on the stings!” “Does anyone have an antihistamine?” “Get a lemon!”) I somehow lost the buttons. I am finished! Second-string buttons, but they sure are pretty. 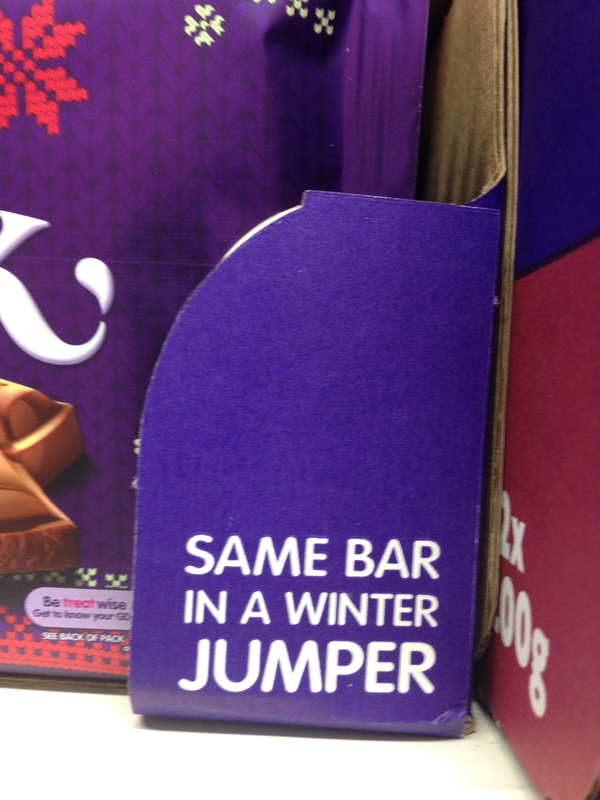 The horror, people! I usually have so much trouble finding buttons, and of course the one time I find the perfect ones they fly the coop. They were green and fit the buttonholes perfectly. Bah! I’ll go buy more tomorrow, but in the meantime the ones above look pretty cute, don’t they? They’re ceramic so I don’t think I can leave them on when Little Miss Feisty wears the cardi, but they certainly work as place-holders. And use the comments section below to let me know what you think of the substitute buttons. Too much? Just enough? I’m going to go take an antihistamine and lie down now. Anyone got a spare lemon?